New satellite imagery obtained by CNN's Security Clearance shows increased activity at a North Korean nuclear facility. 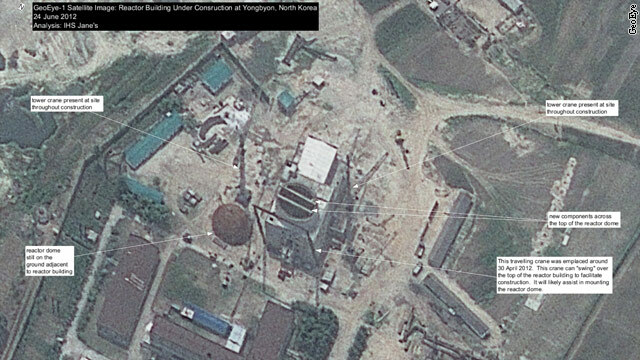 The imagery, provided to Security Clearance by GeoEye with analysis by Allision Pucionni at IHS Jane's, shows the extent of construction at the Yongbyon light water reactor since construction resumed this spring on the facility. 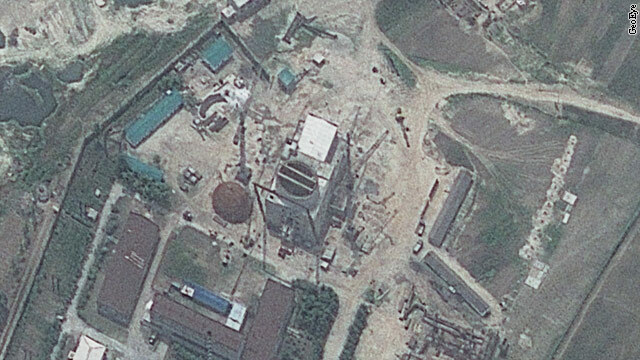 The satellite snapshot from June 24 shows components have been added to the reactor building, including across the open roof, according to Puccioni, a senior imagery analyst at IHS Jane's. A "traveling crane" can be seen and is believed to have been added in April. "This crane can 'swing' over the top of the reactor building to facilitate construction," according to Puccioni. "It will likely assist in mounting the reactor dome." That dome is visible on the ground beside the main reactor building. Pyongyang claims the reactor is "intended to help solve domestic energy shortages," according to the North Korea watchers behind the blog 38 North. "It is also an important component in its effort to build nuclear weapons," according to the blog which published images this spring after construction resumed on the facility. 38 North is run by the School of Advanced International Studies at Johns Hopkins University. Even when the dome is in place, a significant amount of work on the building will be necessary, according to Puccioni. The analysts at 38 North detailed what remains. "The next major step in the construction of this facility will be the loading of the heavy components, such as the pressure vessel, steam generator, and pressurizer, likely through the cylindrical opening in the roof of the reactor containment building. Exactly when that process will begin is unclear; it depends on the availability of the heavy components," according to a May blog post. "Recently, the North Koreans stated that those components were being manufactured parallel to the construction of the reactor buildings. The loading process could last 6-12 months." North Korea, which withdrew from the Nuclear Nonproliferation Treaty in 2003, had agreed in February to suspend nuclear activity at Yongbyon in return for shipments of food aid from the United States. But Pyongyang then carried out a failed long-range rocket launch in April that Washington said breached the terms of that deal. Work on the facility had stopped in December 2011, a development which, according to 38 North, was due either to the death of Kim Jong Il or, more likely, the approaching winter weather. Thanks for a marvelous posting! I seriously enjoyed reading it, you will be a great author.I will always bookmark your blog and definitely will come back very soon. I want to encourage you continue your great job, have a nice holiday weekend! Who cares!!! My boyfriend thinks the same with me. He- is eight years older than me, lol. We met online at- Agelover .c-0`m ,a nice and free site for Younger- Women and Older Men, or Older Women and Younger Men, to- interact with each other. Maybe you wanna check out or- tell your friends. durp tee do. ta teedle dee tum. go drink all the stuff under your sink!!! Ah sooooo, you must be Kim's 'mystery woman'! We should get one of our microdrones to nightly drop a pound of borax solution into the reactor and primary loop components. It's just enough that it wouldn't be noticed, until comissioning day when they are absolutely confounded at trying to get the reactor to work. $100 worth of sabotage can go a long way. You are, sir, a genius. How do you get this idea directly to Obama or Biden? Instead of spending all of its money on missiles and nukes, the government of North Korea should be spending money on farms and infrastructure for their people. They are starving while their leaders live in the lap of luxury. They are supposed to be working for the good of the public and, like too many other governments out there, are not. At least this project could improve the welfare of the people. P.S. If China was against this, they could easily stop it (who do you think gives North Korea most of its power and food imports). Considering one in six Americans live on food stamps and that the US spends more money onthe military than the rest of the world combined- I do hope your not being preachy! i hope they bomb the US Government. We should drop a smart bomb right down that shaft in the picture. And attach snitcher to it. What an ignorant comment. Go visit Haeyong Camp 105 and report for work if you think the N. Koreans are the wronged party. If you survive even 1 week in that Communist Death camp then maybe you can comment on the foibles of Us foreign policy. We may not have a stellar reputation, but we don't commit mass murder against our own people. They went *way* beyond Communism,, into Idol Worship. Even Red China didn't try to pass a "discovered child of Mao's as the Supreme Ruler of China. Move to Schedule 2 – thank you. Well ....appears to be in one piece.....the South Koreans must not be too worried. Big thank yous go out to the Pakistanis for selling them the tech. Why wait n show us proofs! Nuke em.out before they nuke us. Just watch proofs on tv! Don't make other 9/11 mistake! you must be the typical dumb peurto rican.... nuke north korea and the portions of that world will nuke us, numnuts go back to counting bananas instead. south korea has lots of cash from their exports they dont need the american military to do the job they should be doing. do what job moron? you make it sound like going to war with north korea is that simple... you clearly are an inbred. I would like to say that this blog really convinced me, you give me best information! I don't see any difference in the two photos? Maybe they should have just lied to the world like Israel did when they stated construction of the Negev NRC was only an innocent desal plant. Let's face it – NO ONE can be trusted. Mitt Romney said if his prized thoroughbred house is goanna bring home gold for the USA, his Bain based sweat shop he outsourced to NK vis China must be allowed to manafacture our Olympic uniform! I just can't wait to see our four-legged hero in his red white and blue! USA USA USA! "house" – "goanna" – manafacture? You may be retarded. horse...manufacture! Haha! My english teacher was republican! Haha! Why should they worry? There's plenty of other aggressive things going on in the world that no one is doing much about. So as we sit around sanctioning, (which they say works but does it? ), they just keep advancing to the point that a nuclear war is the end result. Its is working, however the UN never anticipated that the regime would effectively let the entire country starve. The sanctions have been very effective in the fact they did exactly what they were supposed to do which was to put the country in dire straights in order to force action they wanted. Problem is, they cave, we give them food and assistance to keep the ppl from starving then NK goes right back at it again. It truly is the definition of a vicious cycle. Sanctions effctive in North Korea....really who do they trade with, or better yet what do trade with us? North Korea doesn't make anything and most of it's trade is with China. So we "sanction them" and since they really don't trade with anyone but China it doesn't really work. How is it effective? please explain rather than blaming America's own stupidity in giving food aid... they get resources from China, and Russia. Last I checked both countries are not in America's favor. So sanctions failed I would say. "Yes, Pat, instead of spinning, I would like to buy some punctuations and a dictionary, please." Dagnabbit, them pesky nukular thingamajigs are 'a sprangin up from here to tarnation. Good point. Thanks for the clarification. I forget, is anyone inspecting? they cant even feed the majority of their citizens and they have lavish projects like this that go no where and only amount to sanctions against their people. before you say the US isnt providing food for its citizens, its not your govts job to provide food and housing for you. Its yours. If you want a govt that provides those things Im sure N Korea would love a propaganda monkey they can parade around. Thanks for your voice of reason. It's refreshing. Frankly, I think it is stupid that this country thinks it can do whatever it wants, build any amount of nuclear weapons, & try to cram democracy down people's throats. But, at the same time, I see no reason to give free aid to a hostile country. I think countries need to mind their own business until they have an actual reason to be involved. North Korea just talks big and rarely follows through. Live and let live. Team America helps you with spelling! F*!& YEAH! I see that Punnie boy here stole my name to spew his anti-Korean feelings. I say make the same deal to North Korea as the one that South Africans already have, that is to have nuclear power for peaceful purposes without building nuclear warheads! Are you serious? What an asinine statement. You're a pathetic child. The truth hurts don't it. Perhaps its one of those sweat shops Mitt Romney shipped to China to manafucture our Olympic uniforms! The key word in that statement is "suspend". They didn't agree to permanently stop the work, only suspend it. I suspect their logic was to suspend the work until the gravy train showed up, then resume work after the gravy train was unloaded. Standard operating procedure for regimes like that. David, suspension does not necessarily imply the situation is temporary. You can suspend something for an undetermined amount of time effectively making it permanent. There are times when I suspect our satellite technology makes us more gullible than more informed. That site is a well-known "stage", well-known to have international cameras pointed at it. It is well known that anything done there is well-observed. It is no mistake to think DPRK is evil but it is a grave mistake to think they are stupid. Whenever we look there, we are seeing exactly what they want us to see exactly when they want us to see it. I think since the N. Koreans can't launch an ICBM that goes more than 300 miles that we can safely assume this nuke plant will blow up and wipe out half a million N. Koreans. Three hundred miles is well within range of South Korea however! Since NK has a new leader, we should use a different approach in trying to bring about peace in the region! The same old policies of sanctions, insulting rhetoric and provacative military exercises on the border won't encourage the North Koreans to change their position but instead would infuriate them and further isolate them! We need to send Hillary Clinton's rear end to begin a new phase of talks with Jung-Un! At least this time they broke their promise BEFORE we gave them all the goodies, unlike other times where they took the goodies and then broke their word and continued work on nuclear weapons. "THE ONE" told Kim Jr. to stop playing with A bombs. Perhaps the silly sods will blow themselves to smitherines. Myabe we could help them with that?! Great article on the Korean conflict called The Last Bastion of the Cold War at The Rugged Gent. Also another good one there called North Korea's Death Star. Where does in the Bible specifically talk about North Korea? It is because of people like you that don't give book name, chapter and verse that people like us, Christians, are bashed by hell-bound atheists, agnostics, and evolutionists. Next time just don't throw a phrase and back it up with facts! True Christianity is a religion of morals, ethics, reason, facts, history and love which comes from the understanding and practice of the New Testament. If you think the Old Testament says anything about North Korea, everything in the Old Testament was fulfilled in Jesus. The book of Revelation talk about the destruction of ancient Rome, and at the end of judgment day. So, what's left? Ignorant evangelicals in the U.S. and the world sensationalize the prophecies of the Bible and make them fit what they want! Fools! Let the Bible interpret itself; then, we would not have morons calling believers 'iditos'! God bless you all through Jesus Christ and His salvation! Turn or burn!. OMG! Finally a religious person with their heads on their shoulders.... you have no idea how many times I wished to have read someone that actually knows what Christianity is rather than a family that state "Either follow our way of Christianity or you will go to hell for everything that we are not pleased with"...... thank you thank you thank you. North Korea never threatened the US directly... only when the US tried to interfere in North Korean affairs.. Only thing the US should be worrying about is an attack on South Korea, which can result in major drawbacks for the US. So basically it is not the NK starting and picking fights with us, it is us starting and picking fights with them over our affairs in Asia. Put any kind of harm on North Korea, not only China, or Russia will be insulted but as will South Korea. Iran is not the same case as North Korea, in technical terms North Korea at this moment is untouchable. We can not lose what ties we have in Asia, no way no how. end of story.